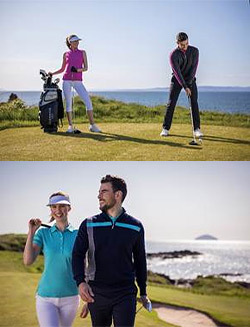 Scotland, January 2019: Glenmuir, the renowned Scottish golf clothing brand, reveals its Spring/Summer collection for 2019 with products continuing to drive outstanding performance delivered in fresh colour palettes Aqua, Fuchsia and Garnet. Glenmuir introduces three new double mercerised cotton polos this season. The technical process behind the fabric removes stray fibres from the cotton yarn and fabric resulting in lustrous silk like handle, luxurious drape and incredible colour retention. The men’s g.Crieff, g.Oban, g.Hamish (RRP £55) are available in 3 colours. Performance wear remains a focus for Glenmuir who have seen record demand in this category. This season three new polos have been developed as part of the Superior Performance selection. The men’s g.Doune, g.Ballater and g.Haddington (RRP £45) are matched for the female in the g.Anastasia, g.India, g.Gabriella, g.Orissa and g.Imogen (RRP £50). The fabric is active and highly functional with moisture wicking technology delivering breathability, UV protection, thermoregulation and enhanced freedom of movement. Lightweight midlayers and knitwear remain a focus, with new colours added to the popular g.Wick and ladies’ g.Carina. The Touch of Cashmere collection has been expanded with the addition of g.Glencoe (RRP £70), and seasonal knitwear made from 100% pure combed premium cotton in the men’s g.Anstruther, g.Dunblane, g.Troon and for ladies’ g.Arbela, g.Macy, g.Antonia, g.Kayla (all RRP £70). Claire Woods - Head of Design, Glenmuir adds: “This Spring/Summer 2019 collection focusses on producing high quality, functional and elegant products. The Glenmuir brand is now retailed in over 30 countries and each of these markets continually demand something fresh and exciting and we believe we have achieved this with this collection”. Glenmuir was founded in 1891 in Lanark, Scotland and continues to thrive in the birthplace of golf. Since its creation the brand has been committed to creating golf and knitwear with impeccable care, skill and dedication to the craft. With a history rich in prestige the brand is retailed in luxury golf resorts globally in over thirty countries including Switzerland, France, Germany, Belgium, Sweden, Australia, South Africa, Japan and Russia and is proud to have produced the European Ryder Cup Team with Shirts and Knitwear for over 30 years. Glenmuir remains a family-run business dedicated to producing the finest golfwear, developing and innovating to maintain its reputation as one of the leading golf brands in the industry.